Lakeshore Records has released Emperor, the original motion picture soundtrack digitally on March 5, 2013. Alex Heffes (The Last King of Scotland, State of Play) composed the original score. A gripping tale of love and honor forged between fierce enemies of war, Emperor unfolds the story, inspired by true events, of the bold and secret moves that won the peace in the shadows of postwar Japan. Matthew Fox joins with Academy Award-winner Tommy Lee Jones, newcomer Eriko Hatsune and award winning Japanese star Toshiyuki Nishida to bring to life the Amerian occupation of Japan in the perilous and unpredictable days just after Emperor Hirohito’s Wold War II surrender. 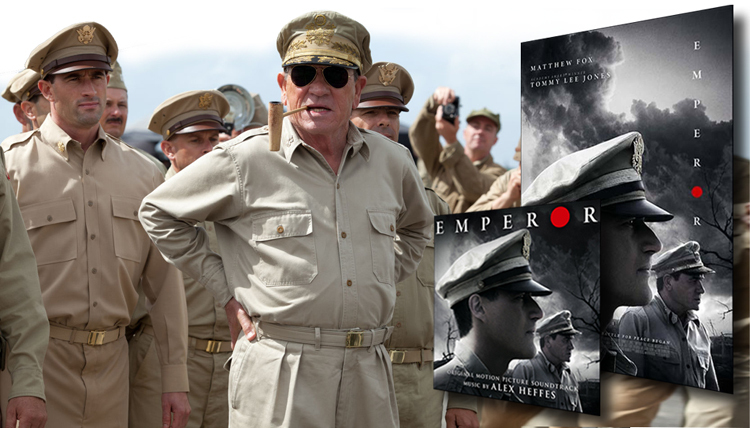 As General Douglas MacArthur (Jones) suddenly finds himself the de facto ruler of a foreign nation, he assigns an expert in Japanese culture – and psychological warfare – General Bonner Fellers (Fox), to covertly investigate the looming question hanging over the country: should the Japanese Emperor, worshiped by his people but accused of war crimes, be punished or saved? To achieve this Heffes features three soloists: piano (Simon Chamberlain), cello (Alice Neary), and shakuhachi (Clive Bell) together with the New Zealand Symphony Orchestra (conducted by Heffes). He also featured Japanese ceremonial percussion to drive the movie forward. The score is available for download from Amazon.com.